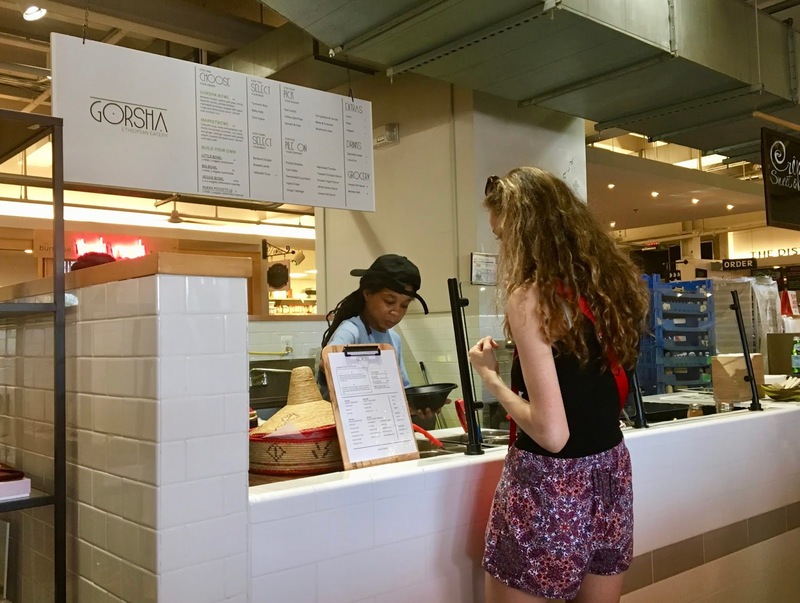 What makes Gorsha a safe bet for gluten and dairy-free diners? Almost everything on the menu is free from both allergens. When I say almost, that means everything except 3 items: the injera bread (and crisps) are not gluten-free, and the only dairy-containing items are two of the sauce options (the white honey and the parsley yogurt sauce). Beyond that, everything is safe. I decided to order the Gorsha bowl, which features Berbere chicken topped with yellow split peas, string beans and carrots, pickled shallots (but they were out of these the day I visited), marinated tomatoes, hot sauce and chickpea sauce. I also added corn salsa and ginger cabbage to my bowl for extra oomph. Everything was served over fragrant turmeric rice. I was impressed with the generous portioning of the bowl, and was eager to dive in and taste the flavors of this colorful bowl. Every single bite of the bowl- no matter the proportion of ingredients- was so incredibly flavorful. If there is love at first bite, I completely and utterly fell head over heels for this bowl. The spicy, perfectly grilled chicken was tender and generously coated with a playful array of spices. The creamy split peas were hearty and worked well to counterbalance the spice of the other toppings. The green beans and carrots packed the biggest punch of heat, but I loved their seared flavor. 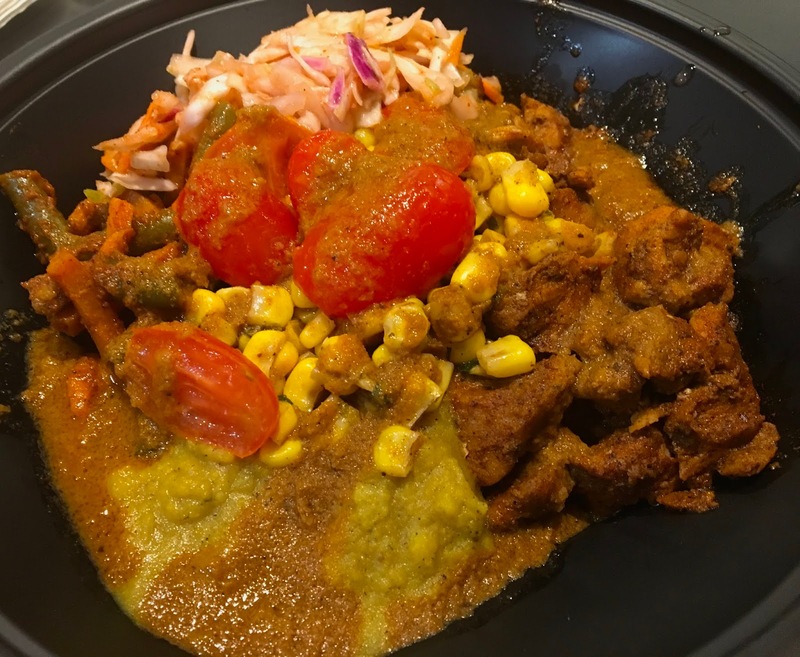 The ginger cabbage, marinated tomatoes, and corn salsa all added additional flavor and texture to the bowl, while the two sauces dazzled me with their bold flavor. But I also can't neglect to mention the turmeric rice, which was perfectly cooked and had a warming turmeric flavor that paired nicely with all of the toppings. For some bowls, layering so many spicy and brassy flavors together could spell disaster, but Gorsha sticks the landing and delivers in every satisfying bite. I did not expect to be as blown away by Gorsha as I was. It kills me that I have been missing out on this amazing food for so long, and plan on making up for lost time by frequenting their Union Market stall going forward. It's rare that I leave a review completely smitten with a restaurant, and I think the food and the staff's warmth and friendliness are what made my experience so delightful. 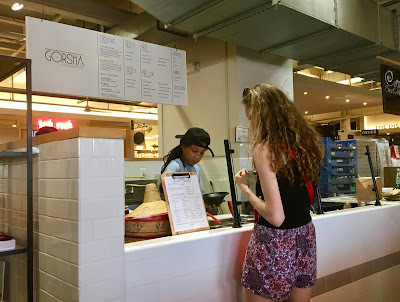 Don't make the mistake that I did: if you find yourself in or around Union Market you owe it to your tastebuds to pay Gorsha a visit.